My oldest son turned three in August. I can’t believe I’m saying that. How do I have a three-year-old? It feels like only yesterday I became a new Mom, not really knowing what the heck I was doing but carrying on nonetheless. And now I have two kiddos and one of them is THREE! Ethan is in love with dinosaurs. He knows the names of so many dinosaurs— even more than I do. Thank you, Dinosaur Train. So it was pretty easy coming up with a theme for the party this year. We kept it low key with only family, but of course I had to decorate. 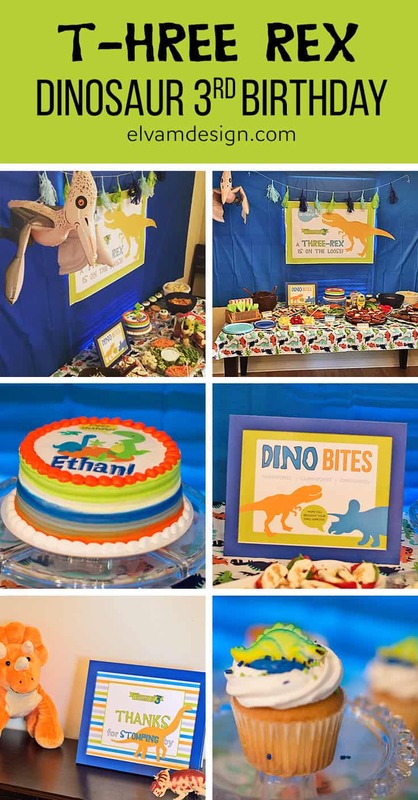 Since Ethan is turning three, I thought a fun, play on words with “T-Rex” would work great. “A Three-Rex is on the Loose!” became the party theme. I used bright colors in orange, green, blue, and gray. I sent out a Facebook invite, so I created a fun cover banner to get the theme and the vibe of the party started. 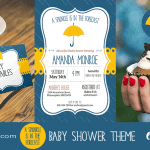 I believe the invite sets the stage to a party so even though I wasn’t doing a traditional printed invite, I wanted to still get guests excited about what was to come. I then went back and created a 5×7 invite for this theme, so one is available in the Elva M Etsy shop. 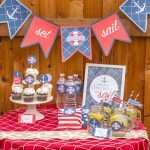 In fact, just about all of the printables used in this party are available for sale, so you can recreate this look at home! Check out the dinosaur listings here. The table is usually what I focus on. 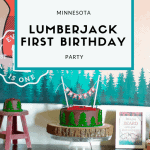 I love to do a fun party backdrop for the food and dessert. When we do parties at our home, we usually do a buffet — fill-up-your-plate or snack— type party. This is the focus of the party! I also created some other signs, including welcome and thank you signs to carry the theme throughout other party spaces. On the table was a “Dino Bites” sign and food tent cards letting guests know what everything was. We bought the cake and cupcakes from Target (SuperTargets have bakeries!). The design on top is one they carry, but they striped the sides for me to match the invite and sign backgrounds. The cupcakes have little sugar dinosaurs they had available. We chose a marble cake, with raspberry filling, and buttercream frosting. Yummy! These turned out great and were affordable too! The birthday boy had a great day (I think this smile says it all). He received so many dinosaurs as gifts. I’m not sure where we are going to store them all! My next task is to organize the toys.